The world is serendipitous. 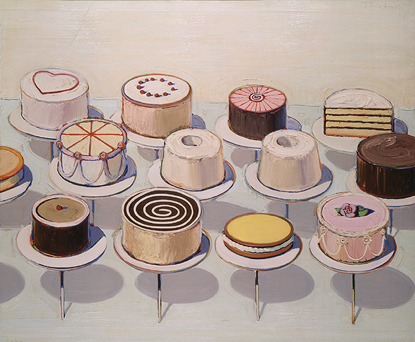 I ran into Hannah Lesk (grad student from HGSE who worked on Radix for a bit) at the LearnLaunch conference yesterday, and she gave me a cool idea for surface area and volume from Wayne Thiebaud’s Cakes. Now pondering my design of problems relating to icing, pricing, and packaging. I’m thinking of having them calculate the cost of icing all the cakes in the picture (based on surface area), and then figuring out how many cakes they could store in a school store pantry before selling them for prom fundraising (using the cake caddy). I’m also thinking of doing some pan conversions.